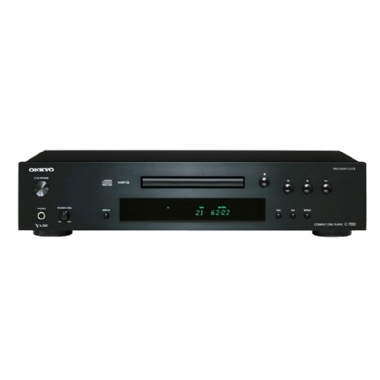 The Onkyo C 7030 - For music lovers who enjoy the tangible experience of playing a physical format, the CD retains its enduring appeal. The pleasure comes not just from browsing a collection of discs and reading the liner notes. It also comes from enjoying your music in superior fidelity. By combining high-quality components and decades of Onkyo audio know-how, the C-7030 CD player delivers a superb playback experience. The key lies in keeping the audio signal clean and free from interference, all the way to the output stage. To achieve this, we employ a new high-precision clock to dramatically reduce timing errors, along with our original VLSC™ to reduce pulse noise. Driving the system is a massive, custom-built transformer that provides a clean and stable power supply. Given how affordablethe C-7030 is, build quality is exceptional. A 1.6 mm-thick flat chassis base helps reduce unwanted vibrations, while the sleek aluminum front panel provides an elegant finish.